They strut around their little area of the farm with a certain air about them. Nothing ruffles their feathers. These two pristine, white Sac County turkeys (named Tater and Tot) are special—and they know it. 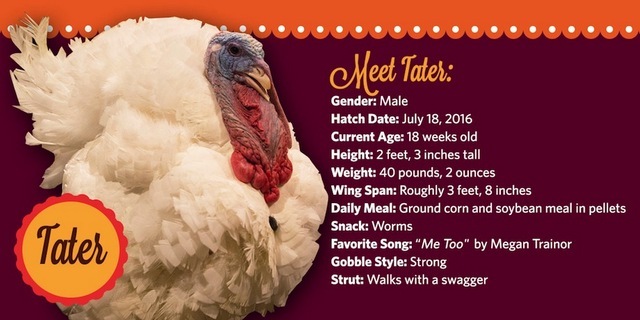 Tater and Tot make their Washington, D.C. media debut in the ballroom of the famous Willard Hotel on Nov. 22, 2016. Through nearly seven decades, the President of the United States has received a turkey from the National Turkey Federation during Thanksgiving week. As part of the White House event, recent custom has the president “pardoning” the turkey, after noting the significance of a time of thanks for the nation’s many blessings and the opening of the holiday season. Two turkeys are selected each year for this prestigious—if quirky—honor. One turkey functions as the “backup” in case the first turkey can’t complete its duties as the national Thanksgiving turkey. 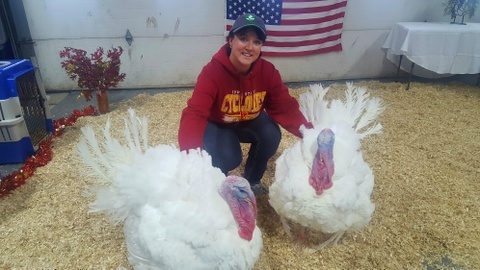 This year’s presidential turkeys hailed from Chris and Nicole Domino’s farm northwest of Early. The 42-pound male birds were born July 18 and were selected in August for their famous role. Chris and Nicole Domino and their five daughters raised Tater and Tot on their Sac County, Iowa, turkey farm. 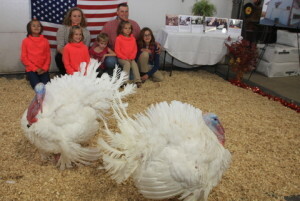 The presidential turkeys received plenty of personalized care during their months at the Domino’s farm, thanks to daughters Adrian, 13; Brianna, 10; Marissa, 8; Addison, 7; and Megan, 6. The male turkeys got their first taste of celebrity with the snacks they were offered. “We tried lettuce, cottage cheese and cooked eggs, but we found out the turkeys love dried meal worms and diced tomatoes,” Chris Domino said. The birds enjoyed other perks, too, including dog toys. “They like playing with tugs and squeaky dog toys,” said Adrian Domino, who helped raise the birds with the help of her parents and sisters. The five girls lavished attention on the turkeys and didn’t stop with special treats. They washed the birds and even played music for them. The first song to elicit a gobble from the turkeys? “Me, Too” by pop singer Meghan Trainor. The turkeys got their first taste of fame on the morning of Nov. 18, when the Iowa Turkey Federation hosted a send-off for the birds. 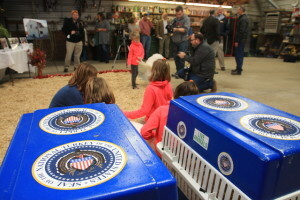 A small group of local and state media, turkey industry representatives and elected officials from Sioux City to Des Moines gathered in a shed at the Domino family’s farm to “meet” the celebrities and learn more about the Domino family’s farming tradition, which has spanned nearly a century. “We highlight the family aspect of farming as we celebrate this fun, turkey-centered tradition,” Irwin said. The official presidential turkey carriers are ready to transport Tater and Tot from their farm near Early, Iowa, to Washington, D.C. The turkeys left for Washington, D.C. in a van early in the week of Nov. 21. After arriving in the nation’s capital, they settled into their deluxe accommodations at the posh Willard Hotel just down the street from the White House. 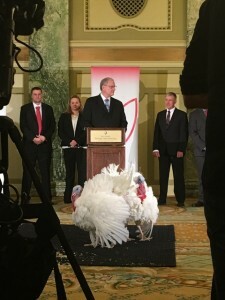 Irwin and the Dominos watched as the Iowa turkeys basked in the spotlight during a high-profile media event at the Willard Hotel ballroom on Nov. 22. 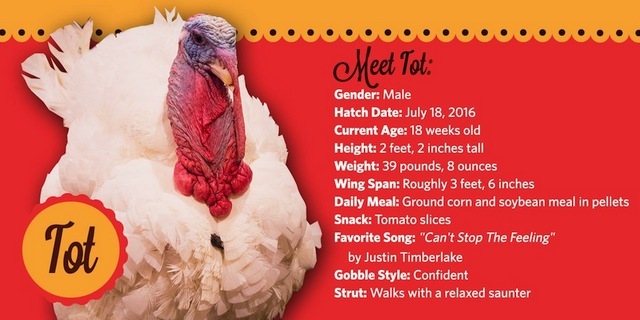 The big day arrived on Nov. 23, when President Obama bestowed names on the birds and issued his pardon for the turkeys, who were presented by National Turkey Federation Chairman John Reicks. The birds retired to Virginia Tech University, where they will live out their lives in comfort. While some historians debate the origins of the presidential Thanksgiving turkey tradition, history is clear that the first presentation of a turkey by the National Turkey Federation occurred during President Truman’s administration. Since then, Iowa has supplied seven of the Thanksgiving turkeys pardoned by various presidents. Prior presidential turkeys have hailed from Ellsworth, West Liberty, Dike and Story City. The birds have represented Iowa during the administrations of President Johnson (1964), President Ford (1976), President Reagan (1983 and 1988), President George Herbert Walker Bush (1991), George W. Bush (2008), and now Obama in 2016.